Harold Lloyd is a name not often remembered today, though in the silent era he was as big as Charlie Chaplin and Buster Keaton. His comedy and dare-devil antics were amplified by his success-seeking go-getter attitude, as a character who would do anything to ahead and get the girl (and most of the time he succeeded). 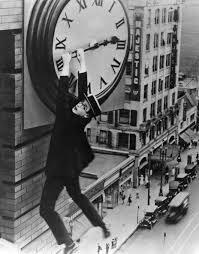 One of his most famous stunts includes climbing up the side of a building and hanging from the hands of giant clock in Safety Last! This feat is made more impressive by the fact that he did his own stunts and wore a prosthetic glove as result of an incident when, during a publicity event, he held a small bomb he mistook for a prop which resulted in the loss of two of the fingers on his right hand. He came into his own in the late teens (1918-1919) with comedic shorts such as Suds and Look Pleasant Please, but was also prolific with feature length films in the 1920s, releasing more material than rival Charlie Chaplin. But yet, the 30s proved to be his downfall. He made it into a few talking pictures, and his voice wasn’t bad, but with the Great Depression audiences no longer related to the idealistic go-getter of yesterday. A new era was upon us, and like so many others, Lloyd fell by the wayside. But anyone interested in the era or anyone who wants a quick laugh will surely get everything they could want from the brilliant and thrilling hands of Harold Lloyd. Let us all take a moment to reflect on the fact that the movie Sharktopus vs. Pteracuda is a real thing. Someone came up with the idea, wrote the script, got other people involved, got funding for it, and put it on TV. Seriously. Along the same lines as such gems as Sharknado and Godzilla vs. Space Godzilla in quality, this movie is so bad it’s almost funny. Almost. If you have the right group of people. Just don’t get caught watching it alone. There you go; I just saved you 90 minutes of your life. Unless you’re having a bad movie night with friends, in which case, you’re a very brave person.